Gold and silver bounced back mainly by the end of the week following the lower than expected rise in new jobs. According to the latest NF payroll report, only 74k jobs were added in December, which was lower than anticipated. But the rate of unemployment slipped to 6.7% – its lowest level in years. Further, initial claims fell by 15k to reach 330k. Besides the employment report, the minutes of the FOMC meeting was released and rekindled the conversation about future tapering of QE3. Despite the release, it didn’t seem to have much of an effect on the prices of precious metals and at best only slightly pressured down gold and silver. For the week of January 13th o 17th, several reports and speeches will take place this week including: Bernanke’s speech, U.S housing starts, EU industrial production, U.S CPI and PPI, U.S federal budget, China new loans, Philly fed index, and U.S. jobless claims. The price of gold rose by 0.67% last week; the average price reached $1,233.88/t. oz which was 1.6% higher than last week’s average. Gold ended the week at $1,246.9 /t. oz. Silver price inched up by 0.05%; the average weekly rate was $19.86/t oz, which was 0.47% below last week’s. Herein is a short overview showing the main decisions, reports and events that will unfold during January 13th to 17th and may affect bullion prices. Bernanke’s speech this week could provide some input behind the recent FOMC decision. The upcoming U.S reports that will come out next week could also offer some insight regarding the progress of the U.S economy. These reports include: Housing starts, building permits, CPI, PPI, industrial production, UoM consumer sentiment, Philly Fed index, and jobless claims. If these reports show little progress in the U.S economy, they could keep pulling up the prices of gold and silver. The Euro bounced back last week against the USD mainly at the end of the week. Moreover, other currencies such as Aussie dollar and Japanese yen also slightly appreciated against the USD. Nonetheless, the strengthening of the Euro may have had little effect on gold and silver prices as their linear correlation remained very weak. The linear correlation between Euro/USD and gold price was very weak during December/January at -0.12. Next week, several reports will be released including: German CPI, and EU industrial production. These news items could affect the Euro/ USD, and, in turn, may moderately affect the direction of gold and silver. During last week, the Indian Rupee sharply appreciated against the USD. If this trend continues, it could positively affect the demand for gold and silver in India. China is still leading the charge in the demand for gold and silver. The progress of this economy could indirectly indicate the progress of the growth in demand for precious metals. The recent economic data didn’t show much growth in China’s economy. China’s manufacturing isn’t growing faster as its PMI slipped in its recent update. The upcoming financial reports on China’s economy such as new loans could offer some additional input about the progress of this country. Finally, gold holdings of SPDR gold trust ETF slipped again in the past week. The ETF was down by nearly 6% in the past couple of months and 1% since the beginning of the year. Gold holdings were at 793.12 tons by the end of last week. If the ETF’s gold holdings continue to dwindle, this may signal the demand for gold as an investment continues to diminish. Gold and silver continued to slowly recover during last week following their tumble in December. The current low volatility in the bullion market might continue until the next FOMC meeting at the end of January will take place. This meeting might stir up the precious metals market again. In the meantime, several reports came out last week and showed the U.S economy is slowly recovering: Philly Fed index rose to 9.4 in January; jobless claims declined by 2k to 326k; retail sales grew by 0.2% during December; both CPI and PPI increased in December by 0.3% and 0.4%, respectively. Despite the sharp rise in CPI, the core CPI inched up by only 0.1%; the annual rate remained at 1.7%. For the week of January 20th to 24th, several reports and speeches will take place this week including: China’s GDP report, German Ifo business climate, U.S existing home sales, U.S manufacturing PMI, BOC monetary policy report and rate decision, China, Germany and France’s manufacturing PMI reports, and U.S. jobless claims. The price of gold edged up by 0.4% last week; moreover, during last week, the average price reached $1,245.38/t. oz which was 0.93% higher than last week’s average rate. Gold ended the week at $1,251.9 /t. oz. Silver also inched up by 0.33%; further, the average weekly rate was $19.86/t oz, which was 1.77% above last week’s price. Following the release of the minutes of the last FOMC meeting a couple of weeks ago, the next FOMC even will take place at the end of the month. Until then, bullion traders will continue to read the tea leaves and see if the U.S reports show of any potential changes in the progress of the U.S economy. The upcoming reports will be related to manufacturing and housing sectors including: manufacturing PMI and existing home sales. The regular weekly update on the jobless claims will also be released. If these reports continue to show progress in the U.S economy, they could pressure down the prices of gold and silver. Moreover, if the U.S dollar continues to rally against leading currencies such as Euro and Aussie dollar, this could also moderately pull down the prices of gold and silver. The Euro/USD and precious metals had a very weak correlation in recent weeks (during December/January the linear correlation was only -0.12 – mid weak correlation). These correlations show that the U.S dollar had little to do with the progress of precious metals. As such, this could suggest the progress of the U.S dollar will have little effect on precious metals prices’ development. During the previous week, the Indian Rupee slightly depreciated against the USD. If this trend continues, it could adversely affect the demand for gold and silver in India. China is still leading the way in its demand for gold and silver. The progress of this economy could indirectly indicate the potential development in the demand for gold and silver. The upcoming financial releases on China’s economy including GDP for the fourth quarter and manufacturing PMI could offer some additional info regarding the progress of this country. Finally, gold holdings of SPDR gold trust ETF changed course and rose in the past week – for the first time since early November 2013. The ETF was still down by nearly 5.5% in the past couple of months and 0.5% since the beginning of 2014. Gold holdings were at 797.054 tons by the end of last week. If the ETF’s gold holdings continue to pick up, this may signal the demand for gold as an investment is slowly recovering. In conclusion, this week gold and silver might continue to slowly rise. Precious metals seem to slowly recover from their tumble in December. The few U.S reports could modestly affect the prices of gold and silver; if they show the U.S economy continues to improve, precious metals might slightly decline. The slow rise in volume of trade could cut down the level of volatility of prices. Finally, if the demand for gold and silver as investments continue to pick up, they could slightly strengthen bullion prices. Therefore, I remain neutral on gold and silver. Gold price continued to slowly recover during last week, while silver changed course and fell. The weakness in the equities markets and the depreciation of the US dollar against the Euro and Japanese yen may have contributed to the rally of the yellow metal. During last week several reports were released: U.S jobless clams inched up by 1k to reach 326k; American existing home sales slightly disappointed and rose by only 1% during December to reach 4.87 million home sales. These reports, however, didn’t seem to affect much the financial markets. For the week of January 27th to 31st, several reports and events will take place this week including: FOMC meeting, Euro group summit, U.S new and pending home sales, U.S GDP for the fourth quarter, China’s manufacturing PMI, EU monetary development, U.S consumer confidence, and U.S. jobless claims. The price of gold increased by 1% last week; further, the average price reached $1,251.82/t. oz which was 0.52% higher than last week’s average rate. Gold ended the week at $1,264.5 /t. oz. Conversely, silver price decreased by 2.64%; further, the average weekly rate was $19.94/t oz, which was 1.35% below last week’s rate. The upcoming FOMC could affect in the short term the prices of gold and silver. Last month, the FOMC’s decision to taper QE3 by $10 billion resulted in a sharp drop in precious metals prices. 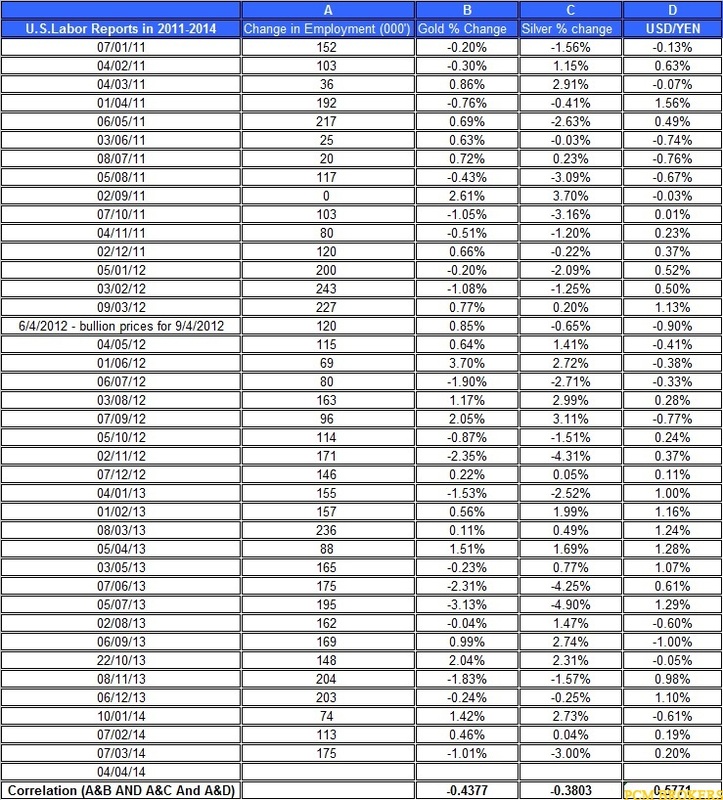 The table below shows the reaction of gold and silver to the FOMC’s decisions in the past several years. The upcoming decision won’t accompany an economic outlook update and press conference, which could result in a smaller effect on the financial markets. If the FOMC decides to taper by additional $10 billion it could have some modest adverse effect on gold and silver for the short term. If the FOMC tapers by a larger margin, it could have a stronger negative effect on precious metals, but again for a short term. If the FOMC doesn’t change its policy, this could result in a moderate positive effect on bullion prices. Besides the FOMC’s meeting, the recent drop in the U.S equities markets may have also contributed to the rally of alternative investments such as gold. The upcoming reports will include: GDP for the fourth quarter, core durable goods, jobless claims, new and pending home sales, and consumer confidence. If these reports present progress in the U.S economy, they could drag down the prices of gold and silver. Moreover, the recent appreciation of the US dollar against Aussie dollar and Canadian dollar may have slightly pulled down precious metals. Conversely, if the U.S dollar continues to fall against the Euro and Japanese yen; this could moderately pull up the prices of gold and silver. The Euro/USD and precious metals had a very weak correlation in recent weeks (during December/January the linear correlation was only 0.11 – mid weak correlation; the correlation between USD/YEN and gold is -0.38). These correlations suggest that the U.S dollar had little to do with the development of precious metals. As such, this could suggest the progress of the U.S dollar will have little effect on gold and silver prices. During last week, the Indian Rupee sharply depreciated against the US dollar. If this trend continues, it could adversely affect the demand for gold and silver in India. The demand of gold and silver China, the leading country in importing precious metals, is likely to play a secondary role in affecting the bullion prices. The development in China’s economy could indirectly indicate the potential progress in its demand for precious metals. The upcoming financial releases on China’s economy including manufacturing PMI could offer some insight regarding the progress of this country. Finally, gold holdings of SPDR gold trust ETF changed course and fell in the past week. 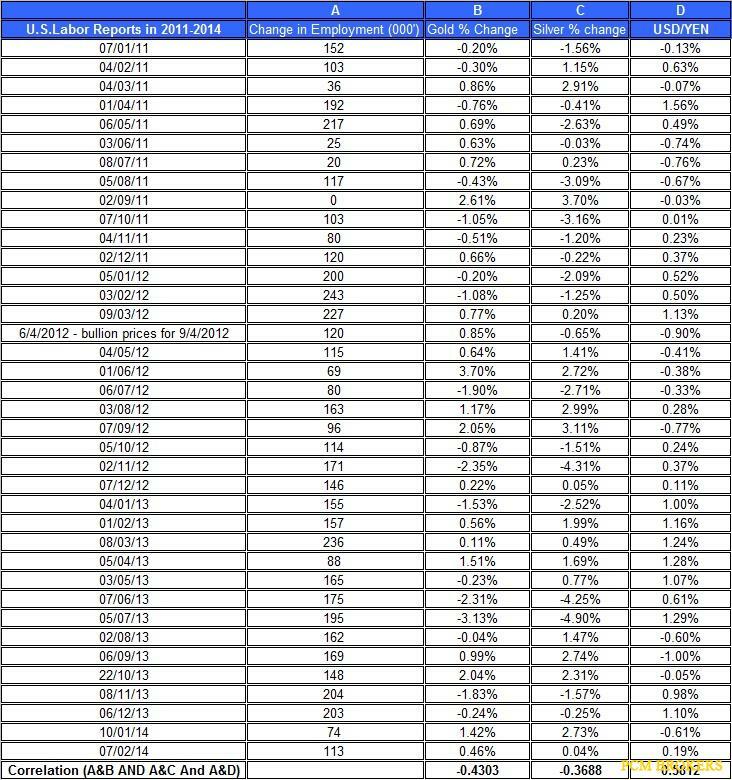 The ETF was down by nearly 6.3% in the past couple of months and 1.34% since the beginning of 2014. Gold holdings were at 790.456 tons by the end of last week. If the ETF’s gold holdings continue to fall, this may signal the demand for gold as an investment is further falling. The recent rise in precious metals prices may result in some sell-offs. But if the U.S equities markets continue to fall, this could steer investors towards alternative investments such as bullion. The FOMC’s meeting might modestly stir up the bullion markets if the FOMC were to change its monetary policy; currently, analysts expect that the FOMC will taper again QE3 by additional $10 billion. The upcoming U.S reports such as core durable goods, GDP for fourth quarter, and home sales could affect the prices of gold and silver; if they show the U.S economy continues to improve, gold and silver might slightly decline. The rise in volume of trade could reduce the level of volatility of prices. Finally, if the demand for gold and silver as investments continue to decline they could slightly weaken bullion prices. Therefore, I think gold and silver could continue to rally. Gold and silver changed direction and fell last week mainly following the latest FOMC’s decision to cut down again its asset purchase program by an additional $10 billion to $65 billion a month. This mini-taper was expected and yet it still dragged down the prices of gold and silver. Moreover, the U.S economy continues to show slow progress: the GDP for the fourth quarter grew by 3.2% – a slower pace than the third quarter, but still a good result. Conversely, jobless clams rose by 19k to reach 348k. For the week of February 3rd to 7th, several reports and events will play out this week including: U.S non-farm payroll report, RBA ECB and BOE rate decisions, U.S ISM manufacturing PMI, and U.S factory orders. The price of gold declined by 1.95% last week; moreover, during last week, the average price reached $1,251.72/t. oz which was 0.01% lower than last week’s average. Gold ended the week at $1,239.8 /t. oz. Silver price also plunged by 3.23%; further, the average weekly rate was $19.40/t oz, which was 2.68% below last week’s price. Herein is a short overview showing the main decisions, reports and events that will unfold during January 27th to 31st and may affect bullion prices. The recent FOMC meeting concluded with the FOMC deciding to taper again QE3 by $10 billion to $65 billion a month. The table below shows the reaction of gold and silver to the FOMC’s decisions in the past couple of years. As seen, the recent FOMC decision may have had an adverse effect on gold and silver. This effect, however, might not last long. The recent decision didn’t accompany an economic outlook update and press conference. Therefore the minutes of the FOMC meeting, which will be released later this month, could also affect the prices of precious metals. Looking forward, the upcoming reports will include: NF payroll, factory orders, non-manufacturing and manufacturing PMI indexes, and jobless claims. If these reports present slower growth in the U.S economy, they could pull up the prices of gold and silver. Conversely, the recent appreciation of the US dollar against Euro and Canadian dollar may have slightly dragged down precious metals. Thus, if the U.S dollar continues to rally against the Euro and Canadian dollar; this could moderately drag down the prices of gold and silver. The Euro/USD and precious metals had a very weak correlation in recent weeks (during December/January the linear correlation was only 0.22 – mid-weak correlation; the correlation between USD/YEN and gold is -0.38). These correlations suggest that the U.S dollar had little to do with the shifts of precious metals. ECB will decide on its cash rate for February. The current rate is set at 0.25% – the lowest level in Euro Area’s history. The inflation in the Euro Area remains very low (below 2%) and the rate of unemployment elevated at 12%. Moreover, the recent developments in Turkey (see below) could suggest that Europe’s problems are far from over. ECB might decide in the near future to take additional steps in its monetary policy. In the meantime, the Euro/USD could play a secondary role in the progress of the prices of precious metals. The recent devaluation of the lira even after the Turkish central bank hiked its interest rate raised the risk of the Turkish economy. This also could explain why in the past several months Turkey has augmented its gold hoards to over 506 tonnes of gold – recently passing the ECB – and the twelfth largest gold holders worldwide. The rise in demand of this country is likely to have little effect on the global gold demand. During the previous week, the Indian Rupee slightly appreciated against the US dollar. If this trend persists, it could positively affect the demand for precious metals in India. In China, the recent manufacturing PMI dropped to a six month low of only 50.5, which means the manufacturing sectors in China are still growing but the slowest pace in recent months. This week is the Chinese New Year so there will be no major reports on China’s economy. Finally, gold holdings of SPDR gold trust ETF changed course and rose last week by 0.34%. The ETF is still down by nearly 6% in the past couple of months and 1% since the beginning of 2014. Gold holdings were at 793.155 tonnes by the end of last week. If the ETF’s gold holdings continue to rally, this may signal the demand for gold as an investment is improving. Despite the rally of gold price at the beginning of the year, gold is only slightly higher than its initial level at the end of last year. Silver is currently down for 2014. The recent FOMC decision to taper QE3 may have had a modest short term adverse effect on the price of precious metals. Moreover, the ongoing weakness in the U.S equities markets continues to steer investors towards alternative investments such as U.S long term treasuries and precious metals. The upcoming U.S reports such as NF payroll report, factory orders, trade balance, and jobless claims could affect the prices of gold and silver; if they show the U.S economy is slowing down, gold and silver might slightly rally. The rise in volume of trade could reduce the level of volatility of prices. Finally, if the demand for gold and silver as investments continue to improve they could slightly strengthen bullion prices. Therefore, I remain neutral on gold and silver. Gold and silver continued to rally last week following the ongoing slowdown in the U.S: retail sales declined by 0.4% during January; industrial production declined by 0.3% in January. Finally, jobless clams rose by 8k to reach 339k. Janet Yellen, the Chair of the FOMC, testified in the House of Representatives and Senate. She pointed out that if the U.S economy slows down, it could lead the FOMC to implement additional monetary measures, but for now it seems that the FOMC will keep slowly reducing its asset purchase program. In the forex market, the Euro, Aussie dollar and Japanese yen rallied against the USD. This may have also helped pull up precious metals. For the week of February 17th to 21st, several reports and events will come to fruition this week such as: Minutes of FOMC meeting, U.S PPI, China’s new loans, U.S existing home sales, minutes of last RBA meeting, ECOFIN Summit, U.S housing starts, China, and EU’s manufacturing PMI reports, Canada’s retail sales, and U.S CPI. The price of gold rose by 4.4% last week; moreover, the average price reached $1,295.76/t. oz which was 3.02% higher than last week’s average rate. Gold ended the week at $1,318.8 /t. oz. The price of silver also increased by 7.45%; further, the average weekly rate was $20.48/t oz, which was 4% above last week’s rate. Herein is a short overview showing the main decisions, reports and events that will unfold during February 17th to 21st and may affect precious metals prices. This week, besides the minutes of the FOMC, several reports will come out including: Philly Fed index, CPI, PPI, TIC Long Term Purchases, housing data and jobless claims. If these reports show slower growth in the U.S economy, they could positively affect the prices of bullion. Further, the ongoing depreciation of the US dollar against Euro, yen and Aussie dollar may have also helped rally precious metals. Thus, if the U.S dollar continues to weaken against the Euro yen and Aussie dollar; this could moderately pull up the prices of gold and silver. 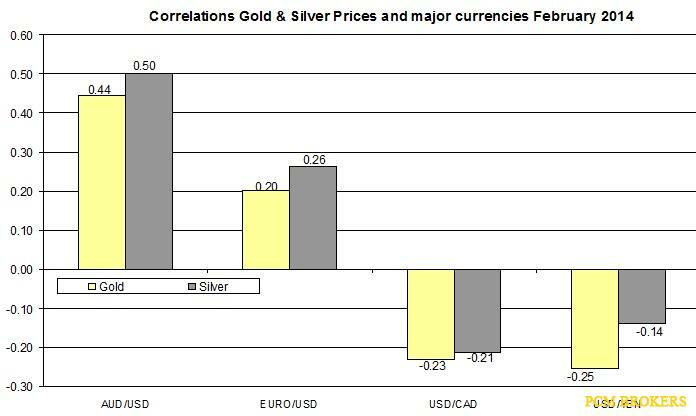 The correlation between Euro/USD and precious metals had strengthened in recent weeks (during January/February the linear correlation was 0.53 strong correlation; the correlation between USD/YEN and gold is -0.57). 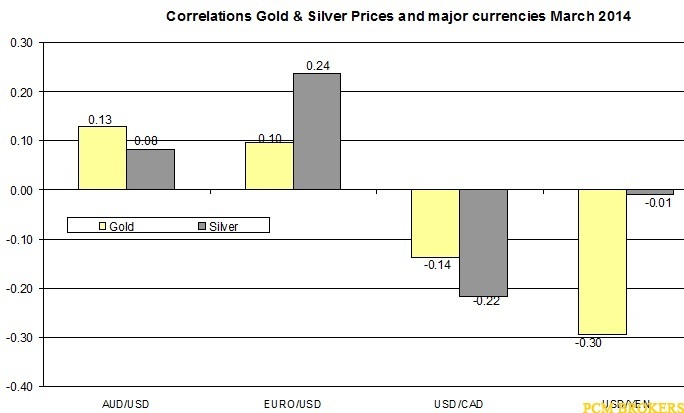 These correlations suggest that the fall of the U.S dollar had an effect on precious metals prices. This week, the EU manufacturing PMI (flash report), German ZEW economic sentiment, and EU Economic Forecast will be released. The EU Summits will also take place this week. These reports and events could affect the Euro/USD, which could play a secondary role in the progress of the prices of precious metals. During last week, the Indian Rupee slightly appreciated again against the US dollar. If this trend persists, it could positively affect the demand for precious metals in India. In China, the manufacturing PMI (flash) and new loans reports will be released. If the Chinese economy continues to slow down, this might imply the demand for commodities in this country is diminishing, which could also curb the recent recovery of precious metals. Finally, during last week, gold holdings of SPDR gold trust ETF rose again for the third week in a row by 0.53%. The ETF is still down by nearly 5% in the past couple of months but is at the same level as it was at the beginning of 2014. Gold holdings were at 801.251 tonnes by the end of last week. If the ETF’s gold holdings continue to increase, this may signal the demand for gold as an investment is improving. The potential slowdown in the U.S could play in favor of the rally of precious metals prices. The upcoming U.S related reports could offer some additional inflation regarding the progress of the economy. The upcoming minutes of the FOMC meeting could shed some light on the FOMC’s future steps and I suspect it could raise the idea that the FOMC is ready to keep tapering QE3. This message could drag down the prices of gold and silver. The drop in the US dollar against leading currencies could have also helped pull up precious metals prices. But if this trend changes direction, it could also cut down the prices of precious metals. The recent rally in the U.S equities markets could also curb down the recovery of precious metals. Finally, if the demand for gold and silver as investments continue to rise, they could pull up gold and silver prices. Nonetheless, I suspect gold and silver may change course and slightly decline as a correction to last week’s sharp rise. Gold and silver prices slipped during last week. The latest economic reports about the U.S and China may have contributed to the recent developments in the precious metals market: U.S new home sales jumped by 9.6%; pending home sales index inched up by 0.1% to 95 during January. Consumer confidence rose from 77.3 to 81.7; the U.S GDP growth rate for the fourth quarter dropped to 2.4%. Finally, jobless clams rose by 14k to reach 348k. In China, the PMI for February declined to 50.2 – the manufacturing sectors are growing as a slower pace. In the forex market, the Euro, Canadian dollar, and Japanese yen slightly rose against the USD, while the Aussie dollar moderately depreciated. This mixed trend may have contributed to the modest fall of gold and silver. For the week of March 3rd to 7th, several reports and events will be released such as: U.S non-farm payroll report, ECB rate decision, China’s manufacturing PMI, Australia’s GDP for the fourth quarter, U.S trade balance, U.S ISM manufacturing and non-manufacturing PMI, and U.S factory orders. The price of gold inched down by 0.16% last week; the average price reached $1,332.46/t. oz which was 0.87% higher than last week’s average rate. Gold ended the week at $1,321.6 /t. oz. The price of silver declined by 2.57%; the average weekly rate was $21.56/t oz, which was 0.75% below last week’s rate. Herein is a short overview showing the main decisions, reports and events that will unfold during March 3rd to 7th and may affect precious metals prices. This week, several reports will be released including: non-farm payroll report, trade balance, manufacturing PMI, non-manufacturing PMI, factory orders and jobless claims. If these reports show little progresses in the U.S economy, they could pull back up the prices of precious metals. Specifically, the non-farm payroll report tends to have a strong correlation with precious metals prices. The table above shows the reactions of the prices of gold and silver to previous U.SNF payroll reports. The chart below shows the linear correlation among leading currencies pairs and precious metals prices. This week, the ECB will decide on its interest rate. This decision could affect the Euro. Some suspect the ECB could cut down again its cash deposit rate again. Several reports will be released including: German factory orders, German industrial production, EU retail sales, and Spain’s unemployment rate. These reports could affect the Euro/USD, which could play a secondary role in the progress of the prices of gold and silver. During last week, the Indian Rupee slightly appreciated against the US dollar. If this trend continues, it could positively affect the demand for precious metals in India. In China, the manufacturing PMI (final estimate of HSBC) report will come out. If the Chinese economy continues to slow down, this might imply the demand for commodities in this country is falling, which could also curb the recent recovery of precious metals. Finally, during last week, gold holdings of SPDR gold trust ETF changed direction and rose by 0.68%. 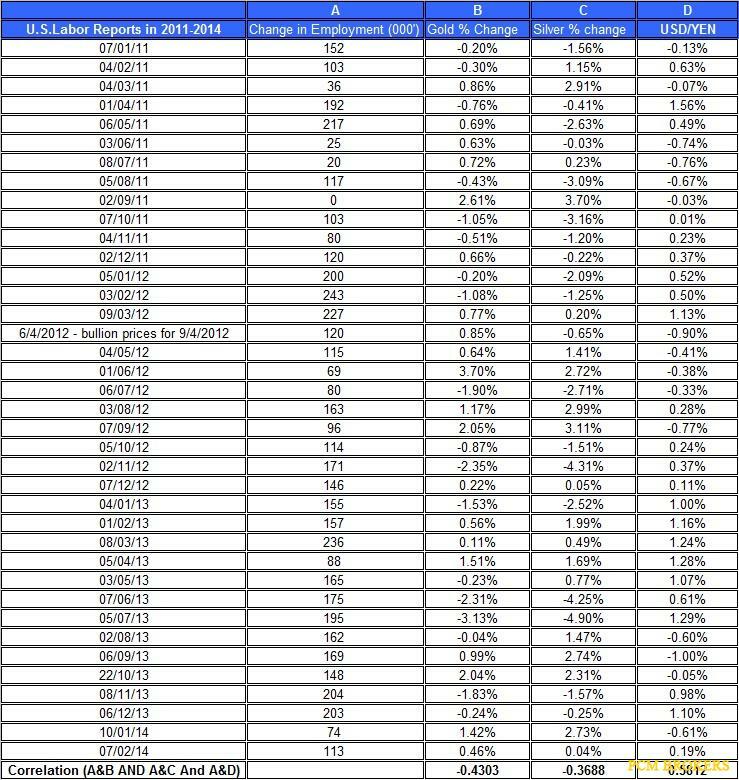 The ETF is up by nearly 0.31% since the beginning of the year (UTD). Gold holdings were at 803.704 tons by the end of last week. If the ETF’s gold holdings continue to pick up, this may signal the demand for gold as an investment is improving. The progress of the U.S economy especially in labor and manufacturing sectors might affect the direction of precious metals. If the U.S labor market slowdown again and NF payroll report shows growth of less than 100k, this could pull up gold and silver. The recent modest recovery of the U.S stocks markets and the appreciation of the USD against the Aussie dollar may have pressured down the demand for investments such as gold and silver. Moreover, if China’s economy slows down, it could suggest the demand for commodities such as gold in China will diminish. Conversely, the recovery in the demand for precious metals for investment purposes as indicated in the rise in gold holdings in the GLD gold holdings might pull back up prices of gold and silver. These opposite forces could suggest that gold and silver move in a mixed trend in the near future. Therefore, I remain neutral on gold and silver for this week. The gold and silver market continued to cool down during last week. In the U.S, several reports were published and showed mixed signal regarding the progress in its economy: new home sales fell by 3.3% during February; pending home sales also slipped by 0.8% to 93.9; the last estimate of the U.S GDP for Q4 2013 was released and was revised up from 2.4% to 2.6%; finally, jobless clams slightly fell by 10k to reach 311k. China manufacturing PMI by HSBC dropped to 48.1 in March – meaning the manufacturing sectors are contracting. This news may have also adversely affected commodities prices. For the week of March 31st to April 4th, several new items will come to fruition including: FOMC Chair Yellen’s speech, U.S non-farm payroll report, ECB rate decision, China’s manufacturing PMI, U.S trade balance, U.S ISM manufacturing PMI, EU and German retail sales, and U.S factory orders. The price of gold tumbled down by 3.14% last week; further, the average price reached $1,302.96/t. oz which was 3.34% lower than last week’s average rate. Gold ended the week at $1,294 /t. oz. Silver price also declined by 2.47%; further, the average weekly rate was $20.72/t oz, which was 4.21% below last week’s price. Herein is a short overview showing the main decisions, reports and publications that will unfold during March 31st to April 4th and may affect precious metals prices. This week, several reports will be released including: non-farm payroll report, factory orders, trade balance, manufacturing PMI, non-manufacturing PMI, and jobless claims. If these reports show signs of progresses in the U.S economy, they could pressure down precious metals prices. Specifically, the non-farm payroll report tends to have a strong relation with gold and silver prices. The table above presents the reactions of the prices of gold and silver to previous U.SNF payroll reports. In the last NF payroll report, which was better than anticipated, gold and silver tumbled down. If this time, the report exceeds the current expectations, bullion prices could decline further. Janet Yellen will give a speech this week at the 2014 National Interagency Community Reinvestment Conference in Chicago. The title of the speech is “Strengthening Communities”. Her words carry weight and could stir up the bullion markets especially if she were to address the FOMC’s monetary policy or the progress of the U.S economy. The US dollar slightly appreciated against the Euro and Japanese yen, which may have also dragged down precious metals. Thus, if the U.S dollar continues to strengthen against leading currencies; this could adversely affect gold and silver. The chart below presents the linear correlation among leading currencies pairs and precious metals prices during March. This week, the ECB will announce its cash rate for April, which currently stands on 0.25%. The current projections are that ECB will maintain its cash rate unchanged and won’t introduce any new stimulus. On the off chance the ECB will change its policy or even hint of potential future changes, the Euro could decline further, which could drag down commodities prices. Furthermore, during this week several reports will come out including: EU and German retail sales, Spain’s unemployment report, EU CPI, Spain’s manufacturing PMI, and German factory orders. These reports and events could affect the Euro/USD, which partly affect the direction of gold and silver. During last week, the Indian Rupee sharply appreciated again against the US dollar. If this trend persists, it could positively affect the demand for gold and silver in India. In China, the manufacturing PMI report will be publish and could shed some light on China’s economic progress. In the flash report, the PMI dropped again and was well below 50. If the index continues to decline, it could indicate China’s manufacturing sectors are contracting. This in turn, could indicate the demand for gold and silver in China will weaken. Finally, during last week, gold holdings of SPDR gold trust ETF remained unchanged. The ETF is still up by 3% in the past couple of months. Gold holdings were still at 816.972 tons by the end of last week. If the ETF’s gold holdings pick up again, this may signal the demand for gold as an investment is strengthening. The recent weakness in the gold and silver market is plausibly an ongoing reaction to the last FOMC decision and the recovery of the US dollar. The signs of little progress in China and modest rally of the U.S economy could have also dragged down precious metals. Looking forward, if the U.S economy continues to show signs of recovery, e.g. the NF payroll report exceeds the market expectations, this could pressure further down gold and silver. Moreover, if the US dollar appreciates further against the Euro and Japanese yen, it could drag down gold and silver. Further down the line, I still think the negative market reaction to the FOMC’s decision will dissipate in the near future. The progress of the stock market could also play a secondary role in determining the direction of gold and silver. If the U.S leading equities continue to slowdown, they could also pull back up gold and silver. Therefore, I think gold and silver might decline further this week. The gold and silver market slightly recovered during last week. The recent non-farm payroll report, in which 192 jobs were added during March, was an improvement from previous months but wasn’t better than expected. The rate of unemployment remained flat at 6.7%. Some expected the rate to fall to 6.6%. This news was enough to pull back up the prices of gold and silver. In the forex market, the U.S dollar slightly depreciated against the Euro and Aussie dollar. This trend may have also contributed to the modest recovery of bullion. In other news, several reports showed mixed signal regarding the progress in the U.S economy: During March, the manufacturing PMI slightly rose by 0.5 percentage points to 53.7, which means the manufacturing sectors are growing at a faster pace than last month; jobless clams slightly rose by 16k to reach 326k. Will gold and silver change direction again and fall? For the week of April 7th to April 11th, several reports and events will come to fruition including: U.S JOLTS Job Openings, minutes of FOMC meeting, China’s CPI, U.S PPI, U.S federal budget, China new loans, BOC Business Outlook Survey, and BOE and BOJ monetary policy meetings.. The price of gold slightly rose by 0.7% last week; conversely, the average price reached $1,288.38/t. oz which was 1.12% lower than last week’s average rate. Gold ended the week at $1,303 /t. oz. Silver price rallied by 0.8%; the average weekly rate was $19.848/t oz, which was 0.01% below last week’s rate. Herein is a short overview showing the main decisions, reports and publications that will unfold during April 7th to April 11th and may affect precious metals prices. Last week’s NF payroll report showed signs of progress and was inline with ADP estimates, but some people expected better results. This was enough to drag down the prices of precious metals. The table below shows the relation between the number of jobs added each month (not revised) and the changes in precious metals prices. Besides the minutes of the FOMC meeting, this week, several reports will be published including: JOLTS Job Openings report, Federal Budget Balance, PPI, and jobless claims. If these reports show signs of progresses in the U.S economy, they could pressure down precious metals prices. The chart below presents the linear correlation among leading currencies pairs and precious metals prices during March-April. This week several reports and events will take place: Great Britain Manufacturing Production, French Industrial Production, and BOE Rate Decision, These reports and events could affect the Euro and British pound, which could partly affect the direction of gold and silver. During last week, the Indian Rupee remained nearly flat against the US dollar but rallied during most of March. If the rupee resumes its rally, it could increase the demand for gold and silver in India. In China, the CPI, trade balance, and new loans report will be released and could shed some light on China’s progress. This in turn, could indicate of potential changes in the demand for gold and silver in China. Finally, during the previous week, gold holdings of SPDR gold trust ETF dropped by nearly 1%. The ETF is still up by 1% since the beginning of the year. Gold holdings were at 809.18 tons by the end of last week. If the ETF’s gold holdings fall again, this may signal the demand for gold as an investment is weakening. The recent NF payroll report pulled back up the prices of gold and silver at the end of the week, but during most of the week precious metals moved in an unclear trend. This unclear could continue this week, especially since the minutes of the FOMC meeting will be release and could raise the speculations around the next tapering decision and the timing of raising the cash rate. This report could stir up the bullion market again for a very short period. Besides this report, the other monthly updates referring of China, U.S and Europe aren’t likely to have a strong effect on the forex and commodities markets. If the U.S dollar continues to depreciate against leading currencies, this could pull further up precious metals. Conversely, if the U.S leading equities continue to fall as they did on Friday, this could steer investors back to gold and silver. Therefore, I remain neutral on gold and silver this week.